Course duration: This course is one day in duration for experienced/certified trainers. Inexperienced/ unqualified trainers would be expected to attend a second assessment day. Certification and Accreditation: On successful completion of this Fire Safety & Marshal Instructor Course candidates will receive a Fire Safety & Marshal Instructor certificate valid for five years. 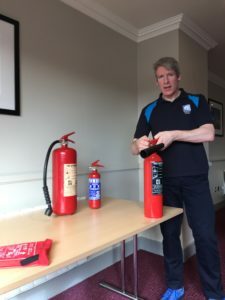 Resource Material: Candidates who successfully complete this Fire Safety & Marshal Instructor Course will be provided with all material required to deliver Fire Safety and Fire Marshal training including PowerPoint, Course Notes, Health & Safety Legislation, videos, check sheets and other relevant guides. Post Training Support: We will provide post training support and advice to any or all candidate who may require it. Refreshments: Tea, Coffee is provided every day. Course duration: This Fire Safety & Marshal Instructor Course is two days including the assessment day. “Very good course, well presented.” Mick Fahey, R.E.C. Safety Services Ltd. Very interesting Fire Safety & Marshal Instructor Course with very good opportunity for class involvement and practical lessons. Claire Hickey, OPW. Excellent! Thanks for everything!! Malcolm Ward.